SUNNYVALE, Calif., April 02, 2019 (GLOBE NEWSWIRE) -- Ooma, Inc., a smart communications platform for businesses and consumers, announced today that – for the sixth year in a row – the company’s Ooma Office service has won PCMag’s prestigious Business Choice Award for Best VoIP System. Ooma, Inc., a smart communications platform for businesses and consumers, announced today that – for the sixth year in a row – the company’s Ooma Office service has won PCMag’s prestigious Business Choice Award for Best VoIP System. The award is part of the magazine’s annual Reader’s Choice Survey, and Ooma once again emerged as the top business VoIP provider among 12 finalists, including RingCentral, 8X8, Vonage, Comcast, Spectrum, and Verizon. 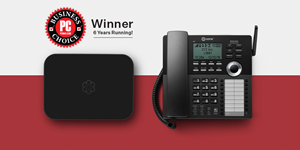 The award (https://www.pcmag.com/news/366695/business-choice-awards-2019-voice-over-ip-voip-systems) is part of the magazine’s annual Reader’s Choice Survey, and Ooma once again emerged as the top business VoIP provider among 12 finalists, including RingCentral, 8X8, Vonage, Comcast, Spectrum, and Verizon. "PCMag has been surveying our business readers for six years to find what delivers the best service, support, and overall experience,” said Dan Costa, editor-in-chief of PCMag. “Every year, Ooma has come out on top. Ooma was number one in nine of the ten categories we asked about. Most importantly, it is the VoIP service our readers recommend most." Ooma Office (https://www.ooma.com/office/) offers a set of features carefully curated to meet the needs of small business, available through a straightforward fee of $19.95 a month per user with no contract required. Customers have their choice of hardware – conventional analog phones, IP phones, virtual service through the Office for Mobile app, or any combination of the three. Advanced features such as a virtual receptionist, ring groups, call parking and multi-site access combine to make small businesses sound big. Ooma (NYSE: OOMA) creates powerful connected experiences for businesses and consumers, delivered from its smart cloud-based SaaS platform. For businesses of all sizes, Ooma provides advanced voice and collaboration features that are flexible and scalable. For consumers, Ooma’s residential phone service provides PureVoice HD voice quality, advanced functionality and integration with mobile devices. Ooma’s groundbreaking smart security solution delivers a full range of wireless security sensors and an intelligent video camera that make it easy for anyone to protect their home or business. Learn more at www.ooma.com. Ooma, Ooma Office, PureVoice and the Ooma logo are trademarks of Ooma, Inc. All other company and product names may be trademarks of the respective companies with which they are associated. The detailed terms and conditions of Ooma's products, services, and support are fully set forth in the Terms and Conditions, available online under the "legal" tab on the bottom navigation bar of the Ooma Web site. PCMag Business Choice logo is a trademark of Ziff Davis Inc. Used under license. Reprinted with permission. ©2019 Ziff Davis, LLC. All rights reserved.